TORRANCE, Calif. (March 31, 2016)—When it comes to performance cars, few things are more important than the connection between driver and vehicle. For luxury automaker Lexus, the continuous pursuit to enhance this connection even includes venturing outside the automotive world for new solutions. Today, Lexus is introducing its latest performance feature: Variable Load Coupling Rear Orientation (V-LCRO), a proprietary technology that enhances performance by allowing the driver to take turns more aggressively while significantly reducing movement across the back and seat. The optional V-LCRO driver’s seat secures the driver in place, refining the functionality of the vehicles’ contoured seatbacks. The optional seat requires the driver to wear a specially designed suit, which, through a complex pattern of hooks and loops, creates an incredible grip at any angle and G-load. In fact, it’s designed to hold the driver in place at up to 3.0 Gs in any direction. To complement the forward-thinking design of the RC F and GS F, Lexus has created a line of exclusive custom-tailored suits. The fashion line connects perfectly with the breakthrough V-LCRO driver’s seats, both in form and function. Lexus launched in 1989 with two luxury sedans and a commitment to pursue perfection. Since that time, Lexus has expanded its line-up to meet the needs of global luxury customers. Lexus is now going beyond its reputation for high quality vehicles with the integration of innovative technology, emotional exterior and interior designs, and engaging driving dynamics and performance. With six models incorporating Lexus Hybrid Drive, Lexus is the luxury hybrid leader. Lexus also offers seven F SPORT models and two F performance models. In the United States, Lexus vehicles are sold through 236 dealers who are committed to exemplary customer service. Lexus product information and images are available online via our news media web site http://LexusNewsroom.com. 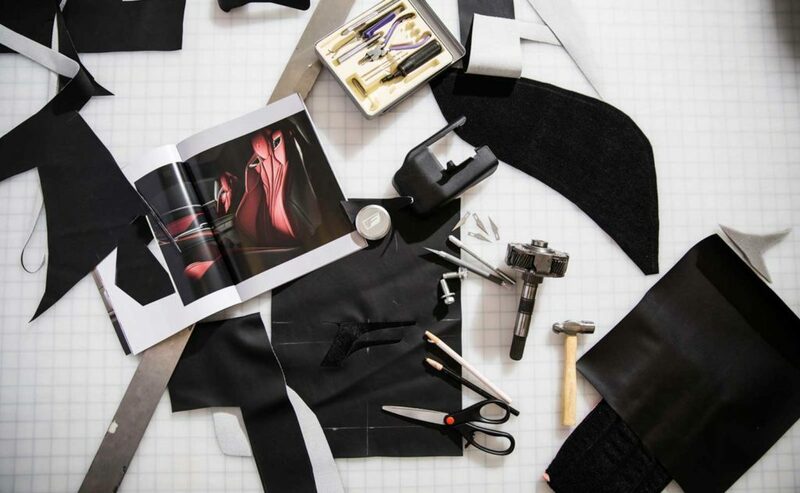 Velcro Companies is a technology-driven, global organization providing fastening solutions that solve problems in simple, elegant and surprising ways for businesses and consumers around the world. We have a heritage of innovation spanning more than 50 years and own over 400 active patents and numerous trademarks, including the VELCRO® trademark, which is registered throughout the world. We develop and deliver solutions for customers through an integrated production and service system that includes manufacturing locations in the United States, Canada, Mexico, Spain and China and sales offices around the world. To buy genuine VELCRO® brand products and to find out more about our company, visit www.velcro.com. At Velcro Companies, we are proud that VELCRO® brand products have become a part of everyday life, but that ubiquity sometimes produces confusion. The VELCRO® trademark should be used only when referring to genuine VELCRO® brand fasteners. Non-VELCRO® brand products should be identified by their functional terms, such as “hook and loop,” “self-adhesive straps,” and so forth. The VELCRO® mark should always be used as an adjective and never as a noun or a verb. The term “Velcro Companies” should be used when referring to our company and its executives. The proper use of the VELCRO® trademark assists us in safeguarding the integrity of the VELCRO® brand, and helps to protect consumers from products incorrectly sold as VELCRO® brand products. For further information on the proper use of the VELCRO® trademark, please see the guidelines on our website.